And so we come to the latter “I” of the IPESSI process, which stands for Improvement. Improvement describes the general process of making things better in your company/startup. You have a software product, app or web site, and you go from version 1 to version 2. You have a product, and you release the “new and improved” model. You have a restaurant, and you redo your decor, or you redo your menu. You release new features for your service. Improvement is different from Scaling (the first S of IPESSI). 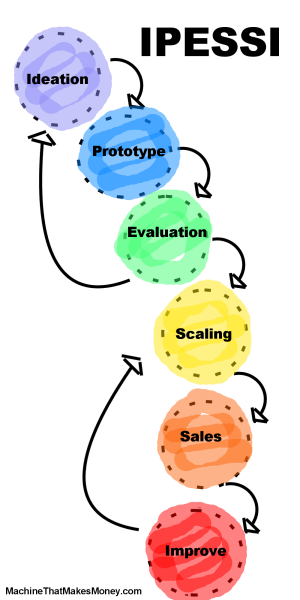 Scaling generally means a big jump, or a metamorphosis, or change of form. So when a caterpillar changes into a butterfly, this is scaling. When a puppy turns into a dog, this is scaling. When a restaurant goes from one city to nationwide franchising, this is scaling. Scaling almost always requires an infusion of capital (either from revenues, savings or investors). See the section on scaling for more info. Improvement is more incremental. If a caterpillar were to go to a gym and work out, this would be improvement. Any machine that is not improving is stagnating. In capitalism, stagnation is a huge problem because of competition. Customers in today’s marketplace expect improvement. A company that is not improving is boring in almost all cases. Improved products/services often give your machine the opportunity to re-approach customers for upgrades, replacements, etc. Apple is a classic example of this process. New phones each year give Apple customers an explicit reason to upgrade, and therefore to hand more money to Apple. If you are #3 in Amazon search results, how do you move to #2 or #1? If you are on page 2 of the Google search results, how do you get to the first page? If traffic is X, how can you move it to 2X? Moving to 2X might involve a big ad campaign, which might mean scaling instead of improvement. But many times 2X can be achieved through improvement instead. As mentioned above, improvement can become a mindset, or a philosphy, at the foundation of your machine. If you can bake it into your culture and make it top-of-mind for everyone in the company, it can do wonders for your machine.